I am totally addicted to the new Doodlebug 6x6 pads. I seriously can't get enough of these bad boys! I literally have DP coming out of my ears, but I just cannot resist a pretty bit of paper. Or even better... four! Another crafty discovery this week are the Papermania Kraft card blanks. I normally avoid shop bought blanks like the plague as I generally find that they are either really expensive or appallingly bad quality. However, I noticed these whilst I was in The Range today and, as I'm addicted to Kraft, thought I'd give them a go. I'm really glad I did as they seem reasonably good quality and were a complete bargain. Will be returning soon to stock up. Allsorts - Photo Inspiration (I picked out the pastel colours and the Easter/spring theme). One Stop Crafts - Easter (Easter bunny!). Crafty Creations - Signs of Spring. My Mum's Craft Shop - Easter Creations/Animals. Hope all well with you guys. I'm off back into my craft den now as I'm home alone and experimenting with Glossy Accents...! Cute card - love the little bunny, too cute. Good luck on your 11 days of crafting! 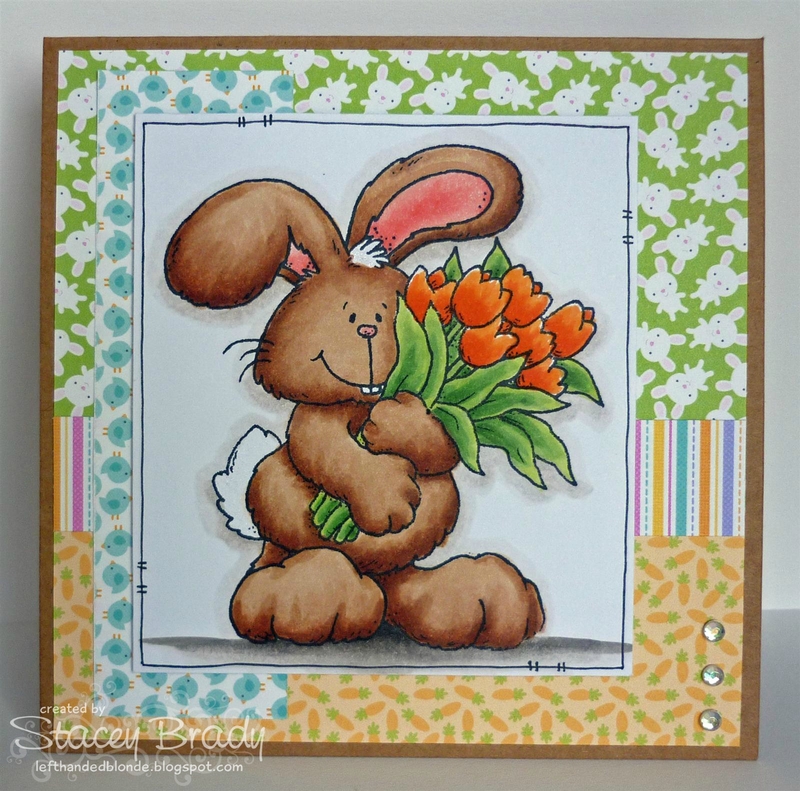 A lovely Easter card with a gorgeous bunny. Thanx for joining us at Crafty Cardmakers this week. check out that cute card and all those lovely patterns and colors! A lovely bright and happy card Stacy. Thanks so much for joining in our inspirational theme at Allsorts this week and good luck. A lovely Easter card, the image is so cute. Thank you for joining us at CCM this time . Adorable! Beautifully colored image and lovely mix of colors and patterns. Thanks for joining us at DYSU. Thanks for joining us at Crafty Cardmakers this week . Very cute card! I like those papers too! I may have to look into those. Thank you for joining us at DYSU! Super cute bunny! Awesome patterned papers, too. Thanks for joining us this week at Crafty Creations Challenges! What a fab bunny and you papers are perfect for this image too. Thanks so much for joining us at Paper Sundaes this week. This is so cute. Love your colouring. Thanks for joining us at Do You Stack Up. What a cutie! Thanks for joining our Easter challenge at Crafty Cardmakers this week, sorry to be so late commenting.